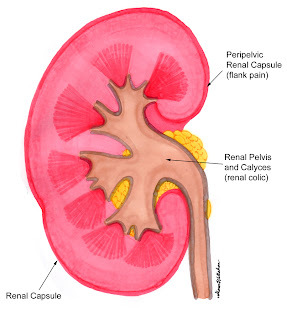 Renal colic is a type of pain commonly experienced in kidney stones. The pain typically begins in the kidney area or below it and radiates through the flank until it reaches the bladder. It may come in two varieties: dull and acute; the acute variation is particularly unpleasant and has been described as one of the strongest pain sensations felt by humans. Acute renal colic is probably the most excruciatingly painful event a person can endure. Striking without warning, the pain is often described as being worse than childbirth, broken bones, gunshot wounds, burns, or surgery. Renal colic affects approximately 1.2 million people each year and accounts for approximately 1% of all hospital admissions. The overall lifetime rate of kidney stones in the general population is approximately 12% for men and 4% for women. The actual pain attack tends to occur in somewhat predictable phases, with the pain reaching its peak in most patients within 2 hours of onset. The pain roughly follows the dermatomes of T-10 to S-4. The entire process typically lasts 3-18 hours. The typical attack starts early in the morning or at night, waking the patient from sleep. When it begins during the day, patients most commonly describe the attack as starting slowly and insidiously. The pain is usually steady, increasingly severe, and continuous; some patients experience intermittent paroxysms of even more excruciating pain. The pain level may increase to maximum intensity in as little as 30 minutes after initial onset or more slowly, taking up to 6 hours or longer to peak. 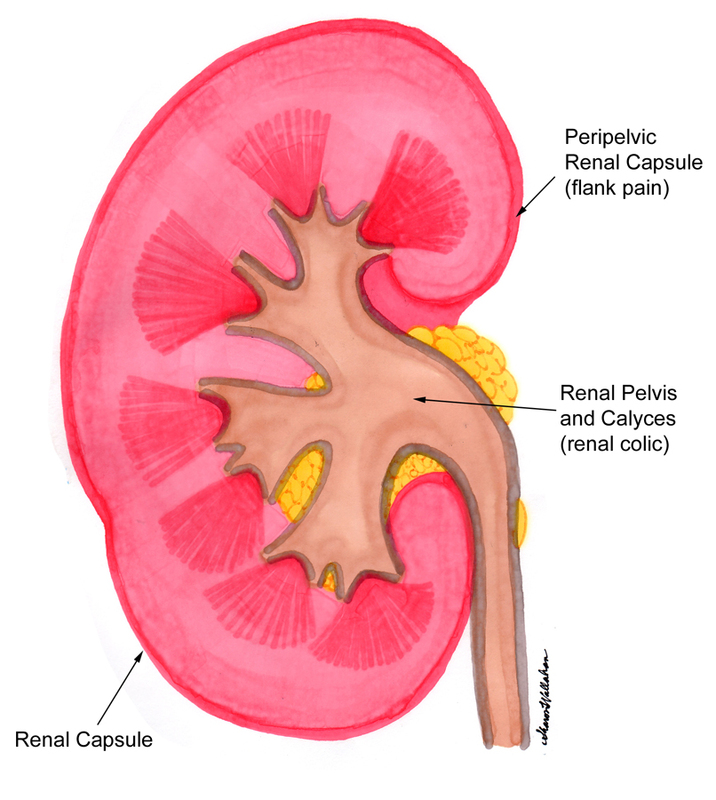 The typical patient reaches maximum pain 1-2 hours after the start of the renal colic attack. During this final phase, the pain diminishes fairly quickly, and patients finally feel relief. Relief can occur spontaneously at any time after the initial onset of the colic. Patients may fall asleep, especially if they have been administered strong analgesic medication. Upon awakening, the patient notices that the pain has disappeared. This final phase of the attack most commonly lasts 1.5-3 hours. Initial treatment of a renal colic patient in the ED starts with obtaining intravenous access to allow fluid, analgesic, and antiemetic medications to be administered. Many of these patients are dehydrated from nausea and vomiting. Using hydration and diuretics as a therapy to assist stone passage remains controversial. Some experts believe hydration may increase the speed of passage of a stone through the urinary tract, while others worry that the extra liquid only increases the hydrostatic fluid pressure inside the blocked renal unit, exacerbating the pain. The ED at the author's affiliated hospital prefers to administer extra hydrating fluid, especially when the stone is 4 mm or smaller, but no firm data support either theory. Clearly, extra fluid should be administered to patients with laboratory or clinical evidence of dehydration, diabetes, or renal failure. Collecting any passed kidney stones is extremely important in the evaluation of a patient with nephrolithiasis for stone-preventive therapy. Yet, in a busy ED, the simple instruction to strain all the urine for stones can be easily overlooked. Knowing when a stone is going to pass is impossible regardless of its size or location. Even after a stone has passed, residual swelling and spasms can cause continuing discomfort for some time. Be certain that all urine is actually strained for any possible stones. An aquarium net makes an excellent urinary stone strainer for home use because of its tight nylon weave, convenient handle, and collapsible nature, making it very portable; it easily fits into a pocket or purse.